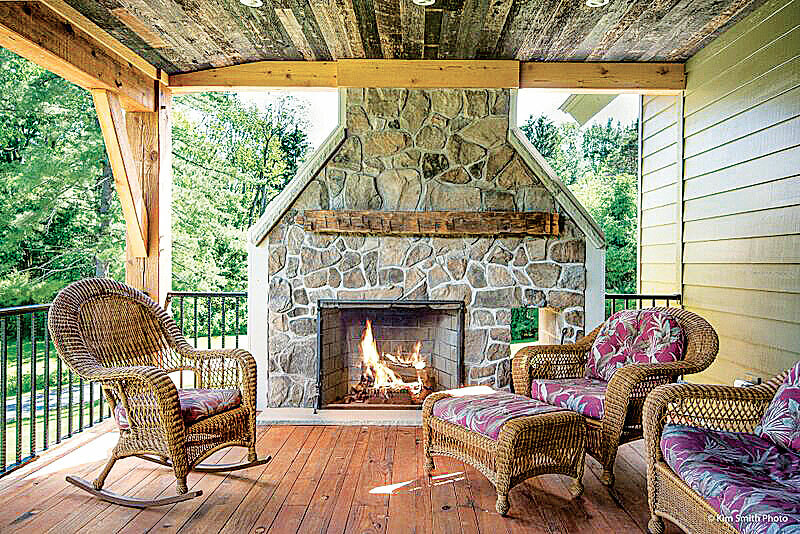 A serendipitous turn of events lands one New York couple in their dream timber retreat. 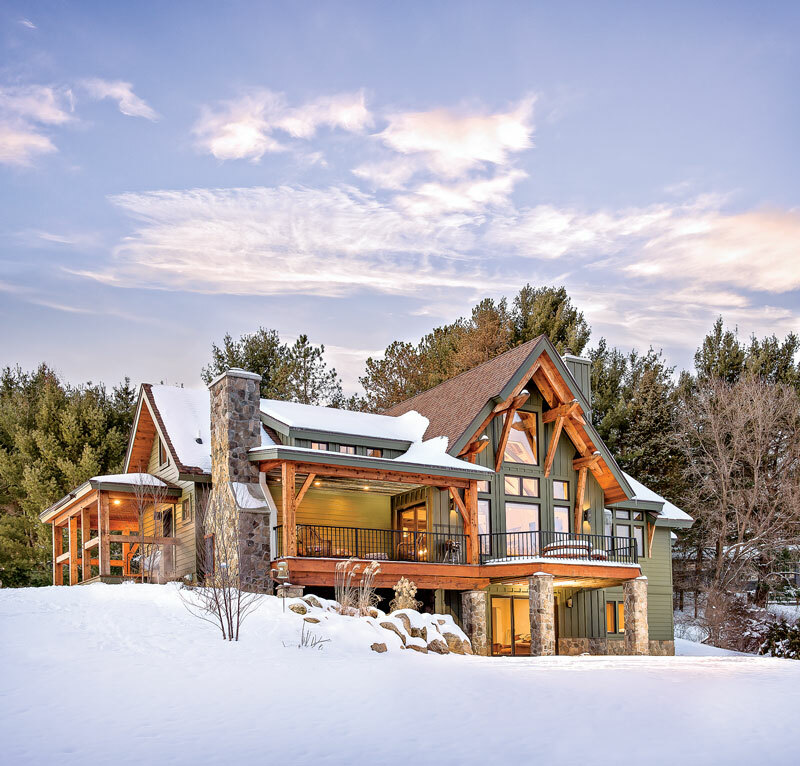 By Suzanna Logan | Photos by Kim Smith, courtesy of Timberbuilt We’ve all heard the saying that “one man’s misfortune is another man’s gain.” In the case of this timber home in upstate New York, that statement couldn’t be more true. 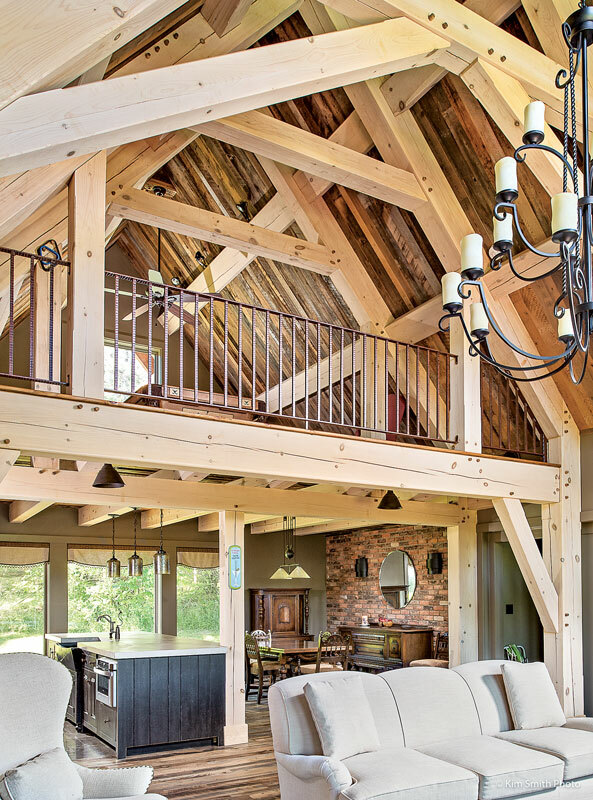 In the main living spaces, the overhead timbers take center stage. 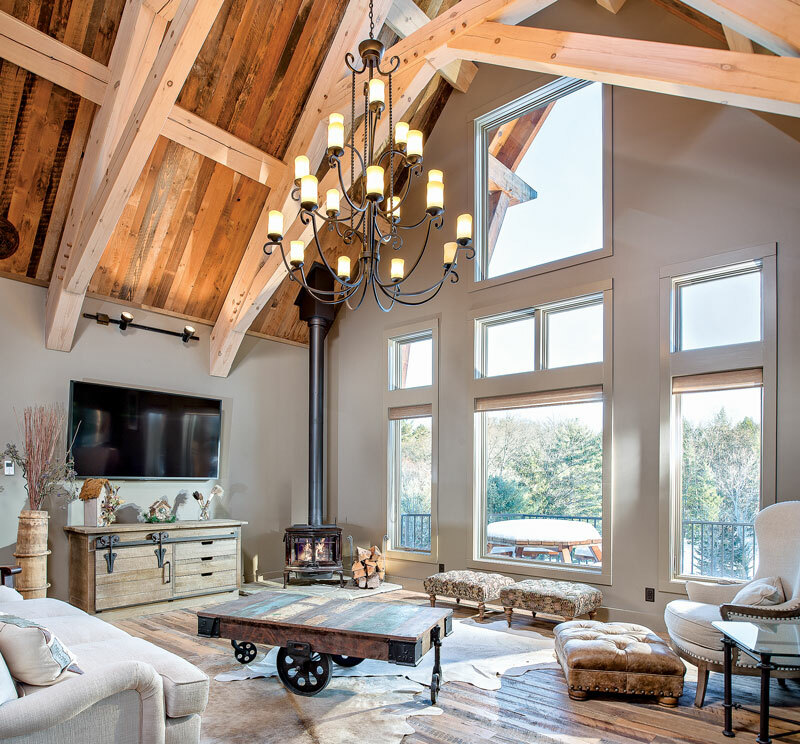 Crafted from whitewashed white pine timbers, the frame stands out against the home’s darker finishes and ceilings, creating instant visual contrast. “When we have parties, everyone hangs in the kitchen,” Peter says. For the couple, having a home that attracts friends and family, and gives them a comfortable place to gather has been the best part of owning a timber home. 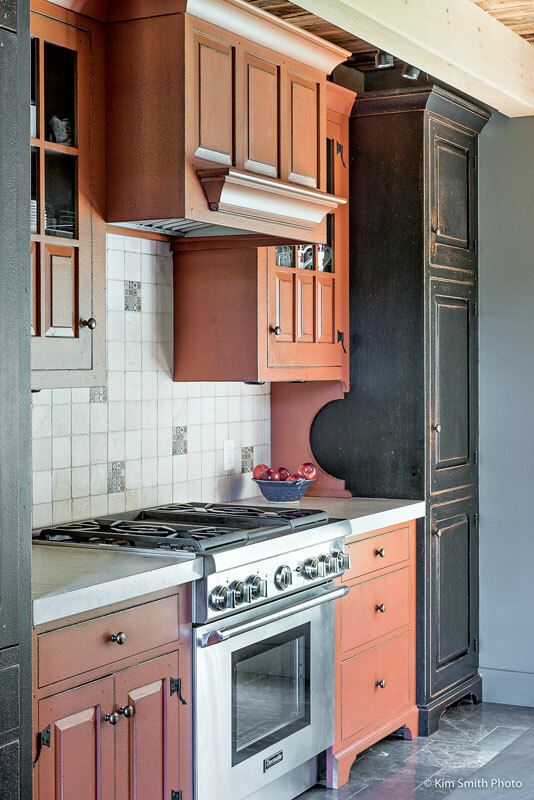 Distressed black cabinets pair perfectly with the reclaimed wood floors and vintage-style barstools. 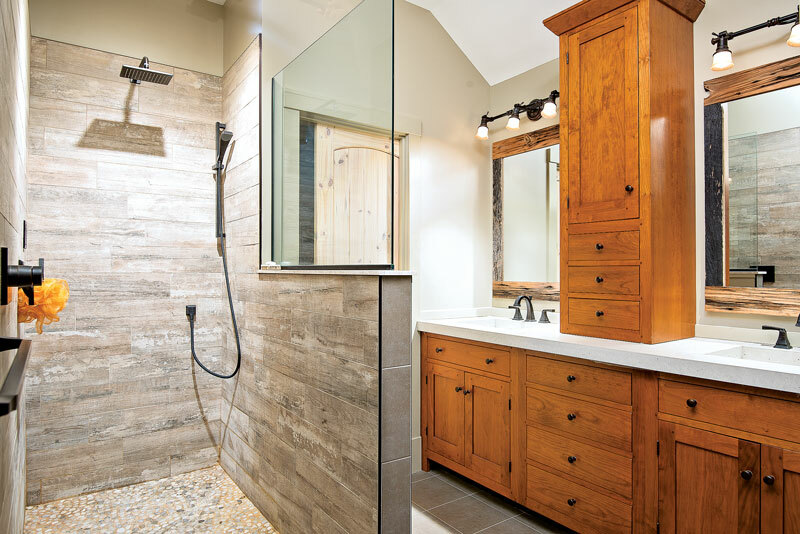 After touring area timber homes, the Glaubers settled on the Marshal plan, a timber hybrid that included an open floor plan, three bedrooms with a master suite on the main level and, maybe most importantly, plenty of outdoor spaces. “We had to have a porch,” Peter says. “Relaxing next to the views and the outdoor fireplace is now our favorite way to start and end the day.” The design phase went along without a hitch, but a few months after breaking ground, a particularly severe winter halted construction. During the hiatus, Peter also put his woodworking skills to good use. Now, wood weathered to rustic perfection adds a sense of history to the new home, beginning with the front door made of reclaimed barn siding. “I fiddled around with it for months to get it right,” Peter says. 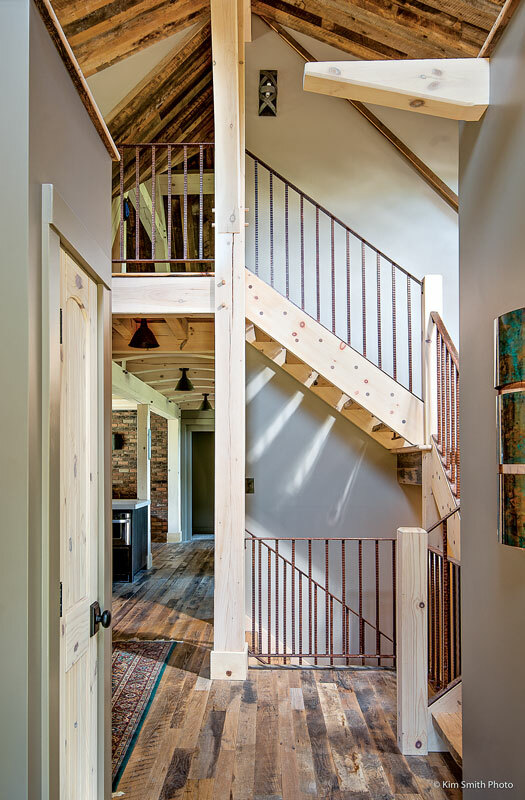 Just inside the entrance, richly textured oak floors from an old tobacco barn stretch out under dark, barn wood ceilings punctuated by whitewashed pine timbers. “Anytime we could repurpose and reuse something we did,” Clemens says. Outside, the resourceful efforts continue. Southern yellow pine timbers that once formed the guardrails on a road leading to Niagara Falls now make up the back deck. The entry porch has a similarly interesting story: it’s comprised of Douglas fir taken from a sauerkraut vat. In the great room, neutral-colored furnishings and trim painted the same warm grey as the walls creates a seamless backdrop to the room’s main event: the views. A trio of versatile ottomans pull double duty as a place to set drinks and extra seating for a crowd. Overhead, a graceful chandelier keeps the eye moving upward to the soaring cathedral ceilings. “It kind of smelled for awhile,” Peter says, laughing. “But the wood is beautiful.” But maybe nothing in the home is quite as eye-catching as the views. “We’re on a hilltop with a pond below,” Peter says. “You look out and all you see is water, trees and wildlife.” Of course, the couple and their guests don’t have to be out-of-doors to enjoy nature. Throughout the interiors, windows separating house from land cause the walls to virtually vanish. “We’re in an area that doesn’t get a lot of sun, so we put in a lot of glass to brighten things up,” Clemens says. The close connection to the outdoors, along with a rambling layout and a wash of muted earth tones and natural finishes help the house live larger than its 3,200-square-feet. “There are a lot of dynamics happening,” George says. 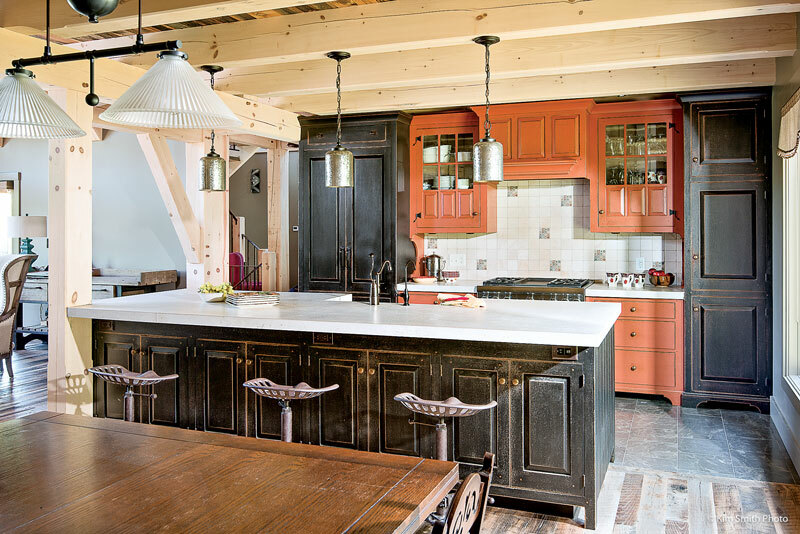 “All of those things combine to create the feeling of elbow room.” Nowhere is the spacious feel more appreciated than in the kitchen — a room with an easy-flow and natural warmth that draws guests like a magnet. “When we have parties, everyone hangs in the kitchen,” Peter says. For the couple, having a home that attracts friends and family, and gives them a comfortable place to gather has been the best part of owning a timber home. The Glaubers’ home is based off the popular Marshal plan, a charming design that lives large thanks to soaring ceilings, an open layout and ample outdoor spaces.